Covesting is a cryptocurrency trading platform that allows users to exchange crypto for crypto (and soon fiat), trade a wide selection of virtual currencies, and copy the trading strategies and positions of other Covesting users. Communication is a key part of the exchange’s value proposition as well, and community analysis and discussion are crucial. This collaborative formula is supported by Covesting’s COV token, which encourages an inclusive environment where the platform’s successes are shared amongst its members. In this setting, everyone benefits from conquering the market together. To join Covesting, simply visit the Covesting website and click on Registration on the upper right-hand side of the page. You’ll be directed to fill in a short form that asks for an email address, password, and a friend’s referral ID if applicable. Referral IDs are a great way to reward your friends who are already members, but they’re not required to sign up. 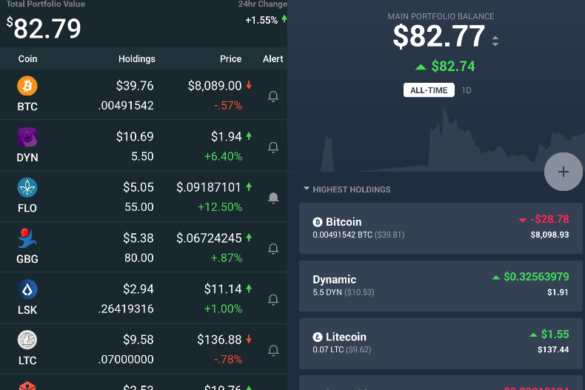 You’ll immediately notice that the Trade window in the bottom right is blacked out, prompting you to transfer funds to your wallet before unlocking the ability to buy and sell cryptocurrency. Click on the link that’s conveniently displayed in this window to be sent to the Funds page, which holds your various Covesting wallets. On Covesting, your wallet is different from your portfolio. 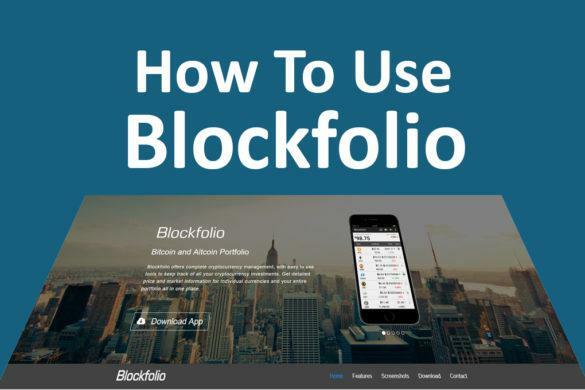 The portfolio has funds that can be used for trading, and you can send them from your wallets. First, you need to deposit funds, and before that can happen you need to verify your account. While some exchanges allow you to deposit and withdraw cryptocurrency from other wallets without verification, Covesting prompts you to verify before depositing either fiat (USD or EUR) or crypto. Currently Covesting is in its soft launch stage and will only enable fiat deposits and withdrawals in the near future. To deposit, click on Deposit next to any wallet, and then the Verify button on the pop-up that appears. Covesting makes verification very simple. As a safe, regulated exchange with global customers, it naturally requires verification of government-issued IDs to comply with all Know Your Customer (KYC) and Anti-Money Laundering (AML) laws. You’ll need to enter all the details of your passport or other ID, including your name, ID number, date of expiry, nationality, and other pertinent information. 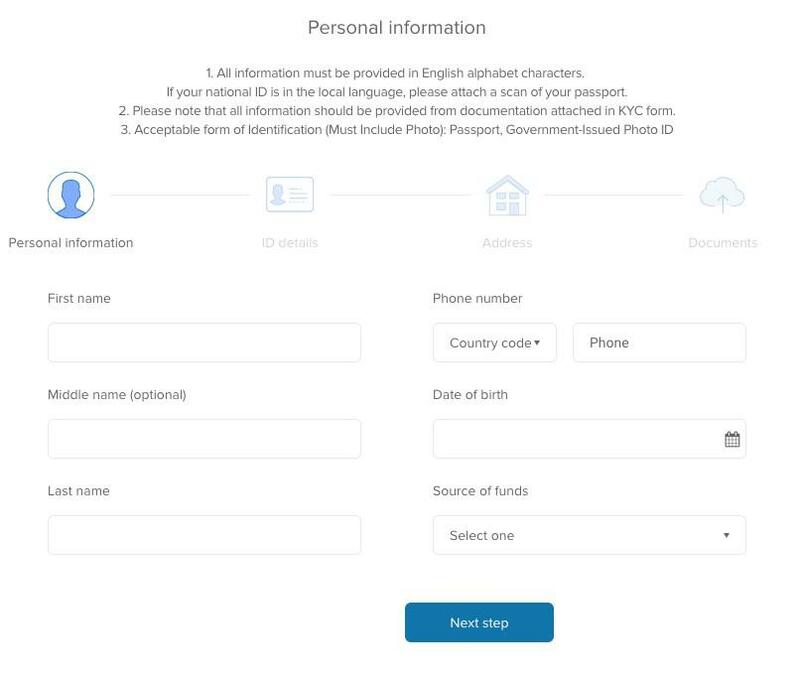 Then, Covesting asks for details about your residence, and finally, uploaded images of both your ID and your proof of residence (bills, bank statement, etc.). It’s a bit frustrating that it asks for a single scan containing both sides of your ID, but anyone with a scanner or a good smartphone app can get it done. 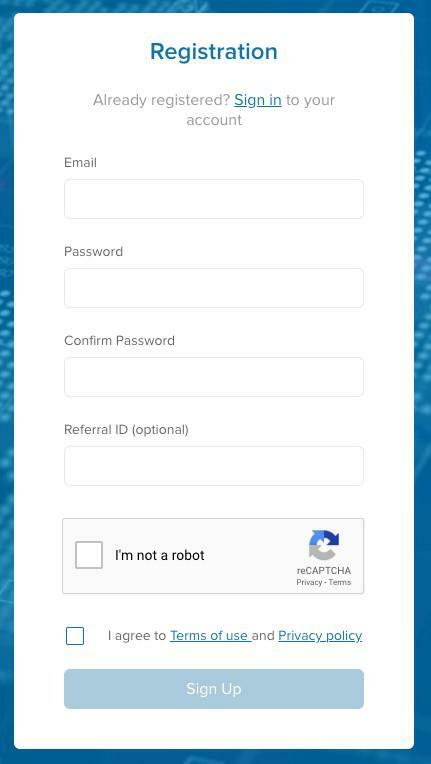 After uploading your documentation, click Submit and the Covesting team will verify your information and email you when the process is completed. Log in, and you’ll see your deposit capabilities are now unlocked. To deposit fiat when it’s been enabled, you’ll click on the Deposit link next to your USD wallet and then link a bank account or deposit via credit card (it’s unclear which will be supported at this time). Right now, users can deposit cryptocurrency by clicking on the Deposit link next to any crypto wallet, such as BTC, and then pasting the deposit address generated by Covesting into the wallet they’re withdrawing from. To make a trade, you’ll first need to transfer funds from your wallet to your portfolio. All trades occur from the portfolio while the wallet is used only for funding. There’s a handy menu at the top of the Funds page for moving currencies between your portfolio and wallet instantly. Simply select the amount you want to transfer, the currency, and that’s it. 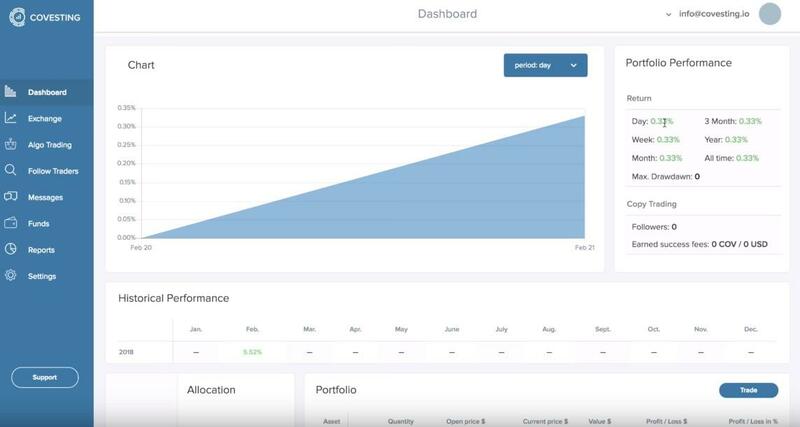 You’ll now see your new portfolio balance reflected on the Dashboard page, which has an appreciable selection of self-tracking tools and charts to measure a portfolio’s growth over time, historical performance by month or year, trading history, open trades and more. To open a new trade, you’ll need to go to the Exchange page. You can navigate there by clicking on Exchange in the left sidebar, or the Trade button in the Portfolio window of your Dashboard. First, select the currency you want to purchase, and the relevant counter currency, such as USD or EUR, if you’re purchasing with fiat currency. 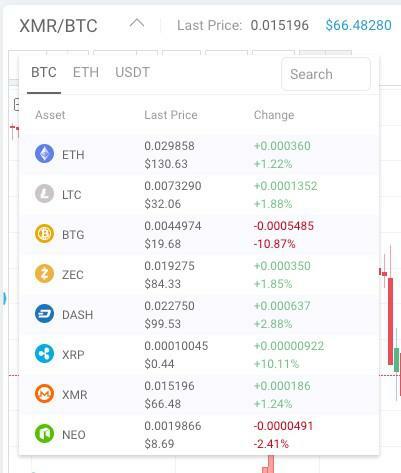 You can also choose to buy crypto with crypto capital like BTC, in which case you should find the ETH/BTC chart if you’re buying ETH with BTC, for instance. In the Tickers box of the Exchange, just click on BTC at the top to see all BTC-denominated assets, and so forth. 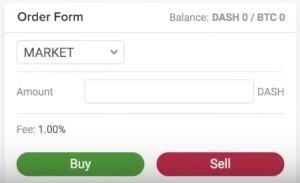 On the order form just under this window, you’ll simply input the amount of ETH you want to buy for your BTC, then click Buy to create a Market order (where you buy at market prices instantly). You can also choose to open Limit orders if you like, in which case your order will appear on the Trade History window below until it’s filled. The best part about Covesting is copy trading, however. To study the public trading profiles on Covesting, click on Traders on the left sidebar. You’ll see a list of Covesting profiles of other traders, which can be sorted based on their returns, their membership duration, number of followers, and more. Click on a profile to visualize their performance over time, their open and closed trades, and the same information found in your own portfolio. 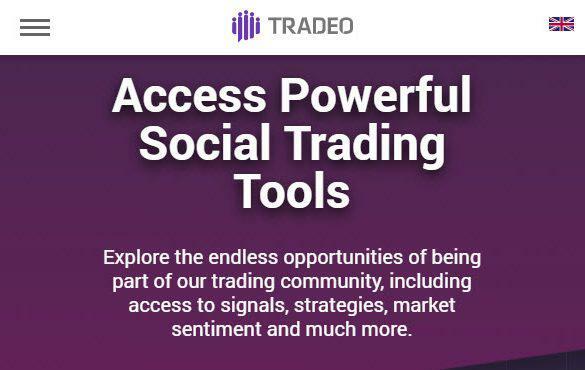 Click Follow to copy their trade, be notified of the trader’s new positions, and more. Copying trades can only be done in COV tokens, which gives an incentive to users to buy them. These tokens concurrently reduce associated fees and are designed to increase in value as they’re periodically “burned” by the exchange. As a European exchange, Covesting takes customers from any EU country but also the United States. Regardless of where you’re from, however, it’s crucial to submit the required identification documents and verify your account. Covesting has a talented and prompt team of ID verification experts who can translate any language though it may take a few extra days. Covesting has a small but inclusive array of cryptocurrencies, including popular ones like Bitcoin (BTC), Ethereum (ETH), and Ripple (XRP), but also newer entrants such as MakerDAO (MKR), Monero (XMR), Omisego (OMG) and of course, their own COV token. Counter-currencies are just BTC, ETH, and Tether (USDT), and Covesting doesn’t currently denominate any of its assets against real fiat. This means anyone who wants to withdraw money will need to convert it back into fiat as well as move it from their Portfolio into their Covesting wallet. For trading, Covesting employs a basic maker and taker fee model with two separate tiers of fees, depending on if you fill existing market orders (taker) or open a limit order for someone else to fill (maker). Paying fees in COV reduces them by half. Maker fees, like on all exchanges, are a bit less expensive. Both are split into six tiers depending on the trader’s 30-day trading volume. For anything less than $500,000 of monthly volume, makers pay 0.15% per trade and takers pay 0.25%. Both decrease to 0.00% and 0.20%, respectively, for upwards of $20 million in monthly trading volume. Fiat withdrawals also impose a fee because integrating fiat functionality is expensive for any platform. Deposits are free. Covesting takes 50 of the relevant fiat currency for every withdrawal. For example, 50 USD for withdrawing dollars or 50 EUR for withdrawing euros. This is a bit expensive and strange that it’s a flat fee, so one can reduce their effective fee by withdrawing in larger amounts. As a social trading platform, there are also fees involved in copying and following other traders on Covesting. They’re steep, to put it candidly. At 2.00% just for copying a trade, it behooves traders to be sure about the user they’re following. If they copy a profitable trade and then stop following them, the platform takes 10.00%. There’s also a trader success fee, which charges 18.00% from all earnings, deducted in case the copy trade resulted in positive returns. Currently there are no transfer limits imposed on cryptocurrency deposits or withdrawals, and the limits on fiat money are not yet known. As the soft launch gives way to Covesting’s official hard launch (yet unannounced), traders will be informed of these restrictions. At present, Covesting is a purely cryptocurrency-to-cryptocurrency exchange, and it allows deposits from any assets listed. Its soft launch is meant to introduce traders to the platform and provide them with the full range of Covesting tools, which they’ll be testing for the inevitable introduction of fiat. It is unclear which fiat payment methods will be supported or when, but given its peers, Covesting may have a way to link your bank account and a credit card as well. Covesting is a very safe cryptocurrency exchange destination for any customer, and it deploys a healthy variety of security tools and standards to keep it this way. All users are prompted to install 2-factor authentication if they haven’t done so, and all exchange funds are stored in offline cold storage for their safety. 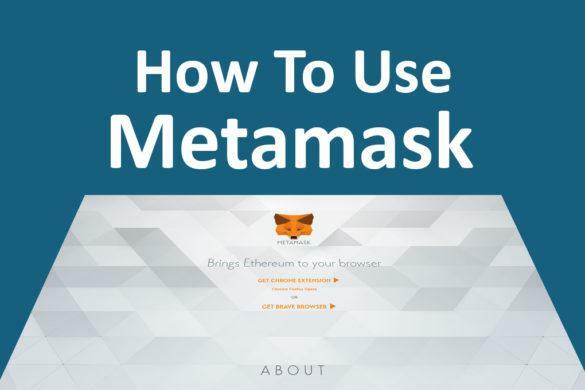 Customer and exchange data are fully encrypted, and the exchange itself protected with anti-DDoS protocols that keep uptime constant. Moreover, Covesting has never suffered a breach or hack, and looks to keep its record clean with a comprehensive security apparatus. Covesting enjoys a stellar reputation among cryptocurrency enthusiasts and the greater community, despite its relatively young age. The team is large and experienced, and is led by veteran cryptocurrency expert Dmitrij Pruglo, who has 12 years under his belt in the finance industry. His team includes over 100 years of experience at some of the largest banks, and their product (the Covesting ecosystem) reflects it extraordinarily well. Covesting is a cryptocurrency exchange with big ambitions: fiat integration, copy trading, built-in messaging, and a strong list of supported assets. However, it also has a large and talented team, which has resulted in an extremely polished, yet comprehensive trading hub. Users will love the ability to pick and choose which functionality they want from Covesting, but their ability to become a recognized trader (and profit accordingly) is number one.